If we may renew Monday’s plea to live in the now: We’re a bare handful of days from a locked-in bowl calendar and will be talking of precious little else for the next month. We’ll be bored to sobs at the mere mention of every perceived snub and outrageous slight and killer matchup by New Year’s Eve. There’s so, so much time for that, and yet our senses are being increasingly assaulted by the college football equivalent of Christmas creep. Auburn AD Jay Jacobs politicking for a one-loss SEC team making the national title game before the cloud of human ashes in Jordan-Hare has even gotten a proper chance to settle is the college football equivalent of hearing “Little Drummer Boy” in Walgreens while waiting in line to buy Halloween candy. Don’t think we’re belittling Jacobs for trying to put his team in the best possible position. We’re not. The BCS as a whole is an institution susceptible to lobbying, and as long as soapbox antics are permissible, involved parties should be allowed to engage in them until they’re blue and orange in the face. Fair game is fair game. But, dude. Of the one-loss SEC teams you’re trumpeting for a title-game bid, you most definitely have a favorite. You’ve seen up close, less than a week ago, the monstrous feats the capricious spider-gods who govern college football are so fond of spinning. If you’re that hell-bent on deploying the rhetorical HUAC howitzer, don’t you want to make real, real sure your one-loss team stays a one-loss team first? A little healthy superstition never hurt anybody around this time of year. Bryan Curtis offers six thoughts following Thursday’s announcement that Florida State quarterback Jameis Winston would not be charged with sexual assault. READ MORE. • No. 1 Florida State vs. no. 20 Duke (Saturday, 8 p.m., ABC): A quick note on the Jameis Winston investigation, before we get to the game: Earlier this afternoon, Florida state attorney Willie Meggs announced that Winston will not be charged with sexual assault. Not everyone will be comfortable immediately switching gears to the ACC championship game. We’re not here to tell you how to feel about that; if you’d prefer to read up on the investigation and its conclusions, here’s the mother ship’s report. It’s not hard to see how this one should play out. FSU is currently favored by four touchdowns and change. Hope abides for some peculiar winds of fate to blow through Bank of America Stadium and make things interesting — it is the ACC, after all — but this Noles team remains too overabundant with talent to allow miscues to catch up to it in any consequential way. Jameis Winston will throw and throw; Devonta Freeman will run and run; Kelvin Benjamin will see if he can increase his towing capacity to seven defenders clinging to his shoulder pads and ankles; and FSU will cruise to Pasadena with minimal fuss. There’s no lingering shame in being worse off than Florida State. There’s lots of company in that. 2. Sit stolidly on enemies’ torsos, undeterred by wailing and flailing limbs. 3. Read a few pages of front-loading washing machine reviews in Consumer Reports before deciding a window into wet, dirty clothes is just too tawdry. 4. Stoically accept punted football. 5. Hang on to football as long as humanly possible while advancing football as little as humanly possible per play in a hypnotizing display of brutal yet precisely calibrated science. 6. Score, or don’t; return to step 1. It ain’t pretty, but neither is being eaten by a python, and you can’t stop either once it starts.1 So, what better way to wind up the season than by taking that tangle of snakes, placing it on the field with one of the country’s most prolific offenses and an enthusiastic defense, and cranking those Never Say Never Again video game voltage handles all the way over to the right? How far will OSU running back Carlos Hyde get after contact? 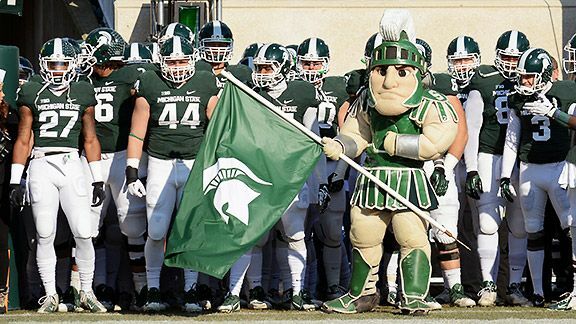 How many times will MSU quarterback Connor Cook hit the ground? For all the derision the B1G took throughout the regular season, it’s making up for it in a hurry with this matchup. • No. 5 Missouri vs. no. 3 Auburn (Saturday, 4 p.m., CBS): Honestly, how to even decide which of these teams is the less likely conference title contender? A year ago this time, Missouri was limping out of an injury-ridden inaugural SEC season with a 2-6 record in league play, while Auburn was suffering a 49-0 obliteration against the eventual national champions to cap off just its second winless SEC season in the last six decades. Had you gone to the Wynn back in August and thrown down $1,000 on a Mizzou-Auburn title game, you would now be contemplating the purchase of a ruby-encrusted rocket ship that runs on kale chips. While we’re on the subject of outrageous fortune: After last week’s tectonic Iron Bowl upset, you’d be hard-pressed to deny that luck has figured into Auburn’s turnaround from 3-9 doormat to 11-1 division champion. But dwelling too much on that means denying that this is a talented bunch that Gus Malzahn has performing exactly the way he wants: Other than Cam Newton having about four inches and 35 pounds on 2013 QB Nick Marshall, this year’s Auburn offense looks a whole lot like 2010’s bunch. Mizzou, meanwhile, has skyrocketed in prominence simply by being healthier than last year’s team. It’s a strange meeting in a strange year: This is the Tigers team out of the East we thought we might see last year, and the Tigers team out of the West we thought we wouldn’t see for a year to come. • No. 7 Stanford at no. 11 Arizona State (Saturday, 7:45 p.m., ESPN): The point of the pregame predictions racket is to pass the time, make money, or settle arguments, and we’re not good at any of those things. But if we were to take one really big swing this weekend, it’d be to bet that the Cardinal–Sun Devils rematch will look very unlike the 42-28 September Stanford victory that marks ASU’s only conference loss to date. Arizona State’s a three-point favorite as of this writing, and we suspect the Sun Devils might be good for more than that, and y’all may cuss us accordingly in Monday’s comment section when we’re proven horrendously wrong. After the early-season tilt-a-whirl that saw the Sun Devils beat Wisconsin amid a bizarro late-night officiating debacle, endure that pantsing against Stanford, get Lane Kiffin summarily fired at the airport with a 62-point mauling of USC, and lose to Notre Dame by three in Arlington, ASU has crafted a seven-game Pac-12 winning streak. The Cardinal, meanwhile, have been all over the place in a banner year for all-over-the-place teams, edging out Washington, losing at Utah, upsetting Oregon, and losing to USC. Tyler Gaffney’s stat line will be an obvious one to watch here, but do pay attention to how ASU sophomore D.J. 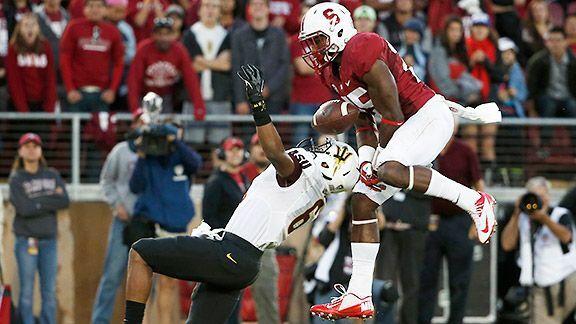 Foster, in the absence of Marion Grice, follows up his 23-carry, 124-yard, two-score Territorial Cup performance against a Stanford ground defense that’s a couple orders of magnitude better than Arizona’s. • No. 17 Oklahoma at no. 6 Oklahoma State (Saturday, noon, ABC): Four Big 12 teams are currently ranked in the Top 25, and those four teams square off against one another this weekend in a pair of games that will — for real this time! — determine the conference champion. Of those four contestants, Oklahoma, which has two conference losses, is the only team mathematically eliminated from league title contention. Watch the Sooners’ discipline level Saturday: They’re being shelled by statewide hype for an ascendant Cowboys program despite holding an 82-18-7 all-time advantage in the Bedlam rivalry, and would like nothing better than to put their erstwhile little brothers in their place and block State’s path to a BCS auto-bid. • No. 25 Texas at no. 9 Baylor (Saturday, 3:30 p.m., Fox): If you’d called this the pivotal game of the year in the Big 12 back in July, you might’ve drawn a few eye rolls. But here we are in early December, and if the dominoes lie right, this could wind up being the most important conference game of the year. What the hell happened? A few things. First of all, Texas shrugged off the humiliating 1-2 start that posed a very real danger of drowning out any football accomplishments with FIRE MACK BROWN, IMMEDIATEMENT hollering before the season was even properly under way; since that opening stretch, the Longhorns have gone on a 7-1 run in conference play, felled only by the Oklahoma State team playing in that other critical conference game this weekend. Baylor, meanwhile, averaged more than 60 points through its first nine games, but saw that record blown to smithereens by (guess who!) Oklahoma State two weeks ago, as Stillwater froze solid and the marauding Cowboys defense bottled up the Bears for only 17 points. We venture into Week 15 armed with proof that Baylor is mortal, particularly on the injury front, but is Texas really the team to exploit that? Conversely, if OSU has already wrapped up the conquest by the time this game kicks off, which team will shrug first? MAC Championship Game: Bowling Green vs. no. 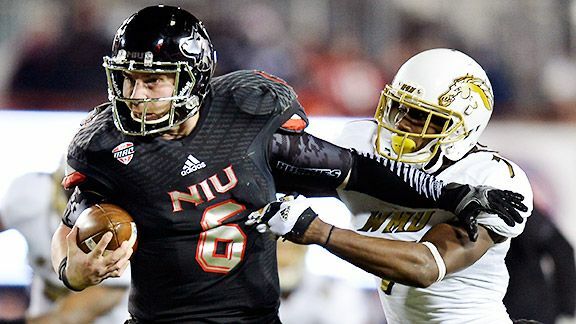 14 Northern Illinois (Friday, 8 p.m., ESPN2): The leadoff conference championship game drops one day before the rest, imbued with the specifically pathos-laden stakes that come with being a ranked team in a non-AQ conference. Win this game and maintain a BCS rankings lead over the first-place AAC squad (whoever that ends up being), and Northern Illinois will play in a second-consecutive BCS bowl.2 Lose — and that’s not at all out of the realm of possibility, given the Falcons’ outstanding defense and not-inconsiderable offense — and the Huskies will head someplace like the GoDaddy.com Bowl, with thoughts of what might have been occupying their offseason. • Best rivalry game of the week, as determined by our exclusive metric based entirely on traveling trophy eccentricity: No. 19 Louisville at Cincinnati (Thursday, 7:30 p.m., ESPN). The American does not have a conference championship game, but shakeups in the race for the conference’s BCS auto-bid remain in play here (more on that in a little bit). For now, let’s focus on the strange grandeur that is the Keg of Nails, which is exactly what it sounds like and has been awarded to the winner of the Bearcats-Cardinals football game since 1929. In a charming finale twist, fans at this year’s game will receive cute wee replica kegs of nails. • Saddest possible football event: That’d be the possibility that Rutgers fails to attain bowl eligibility by ending the regular season with a home loss to 2-9 South Florida (Saturday, 7:30 p.m., ESPN2), which began its season by losing 53-21 at home to McNeese State. • Can the AAC title still be cruelly wrested away from no. 16 Central Florida? The outright title possibility can disappear, as can the BCS auto-bid, but it’ll take some doing: Cincinnati would have to beat Louisville tonight; the Knights would have to lose to SMU in their final regular-season game (Saturday, noon, ESPN); and the Bearcats, without a head-to-head game with UCF this year to act as a tiebreaker, would have to jump the Knights in the BCS standings. UCF gets a share of the conference title no matter what at this point. Even after requiring a late touchdown pass to beat that two-win South Florida team last week? There are no provisions for stripping a team of its title share on the basis of sheer exasperation, no. Unless you’re Notre Dame, 2013’s runaway leader in regular-season games, wins and losses both, on which you probably lost money betting the wrong way. Parlor game to reserve for January use: See if the poor benighted souls who draw the Seminoles as their bowl opponent this year do better than the Huskies did in the Orange Bowl last year, and then argue incessantly over What That Even Means until mid-March or so. Or, they could go back to their Fresnovian ways and score 50. This even though the Cajuns hold the head-to-head advantage thanks to their October victory in Jonesboro. Shared titles are unnecessary to anybody not financially/emotionally invested in banner production, right?